With comments from James Anderson, Josh Edwards, Logan Brown, and Paul Bloch. (click on each shop guy’s name to read their opinions as well). 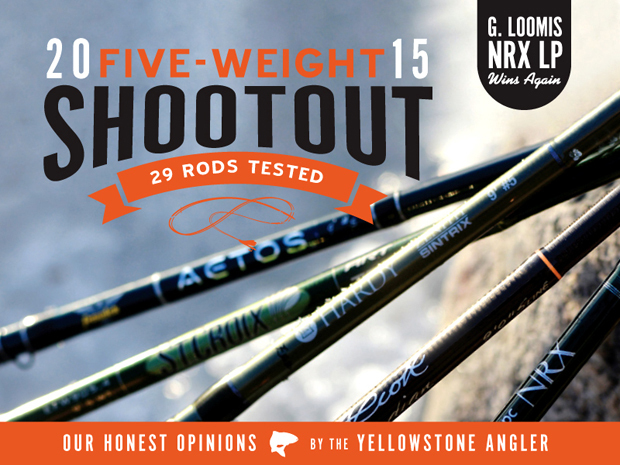 A lot of new rods have been introduced for the upcoming 2015 season, by various manufacturers, so we felt it was time to stir the pot and give you another 5-weight shootout, testing these new rods heads up with the best rods we have found over the past two years. What you will read here is going to be controversial. You are not going to see direct rod comparisons like this in fly fishing magazines or even in on-line magazines or blogs that depend on advertising dollars to generate their income. The fly fishing industry is just too small compared to say the Auto Industry. Fly fishing manufacturers simply tell the publishers if they print anything like this that is putting their products in a bad light, they will never advertise in their publication again. This is too bad, as it is fun to read the latest technical automobile comparisons and evaluations that appear monthly in magazines like Car and Driver, Road and Track, and Motor Trend. It is not our intent to have winners and losers. Sure, there is one winner, but I want to point out that all the rods that made the cut to get into our final shootout are really quite good and anyone would enjoy fishing them. We are continually impressed at how much better the quality and craftsmanship of rods has improved over the past few years. Yes, the best rods are still made here in the US, but many excellent rods are now coming out of Korea and even China. A good example would be the Hardy Zenith, which won our 2011 5-weight shootout and placed a strong 4th in 2015. The keys to building excellent rods are great design, top-notch materials, and good manufacturing techniques, followed up with tough quality control. Read the whole story . . .